I first happened upon The World /Inferno Friendship Society by chance, opening for Subhumans at Logan Auditorium years ago. Since then, I've eagerly anticipated their shows, every time they come through town. It's always a treat to see these Brooklyn natives live. They're excellent musicians with a sense of humor and an avid following. Their April 7th show at Reggies Rock Club in Chicago was once again a rockin' good time. old favorites like "Only Anarchists are Pretty", "Addicted to Bad Ideas" and "Me V. Angry Mob". This time we also got a good taste of their new release, The Anarchy and the Ecstasy. One of my favorite live show moments is the mosh waltz, where everyone is encouraged to partner up with lovers, friends or strangers and waltz. However, it always turns into a magical, swirling cacophony of laughing punks, happily careening into and bouncing off one another. They have a new CD out, and a sweet new sax player who claims to be from the Northeast side of Chicago. Check out their music, touring schedule and What Would Jack Do section, full of brilliant ramblings and amusing musings. Their new album just came out on March 15th on Chunksaah Records. 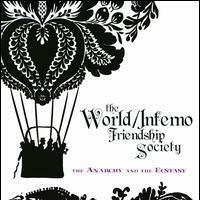 The World / Inferno Friendship Society is one band that might actually be worthy of being called a "society." Consisting of 13 members, recruited from a dream list of "everyone who you never thought would make an album together" (the most peculiar listings from their resume include former members of Blues Traveler, Dexy's Midnight Runners and the NFL's Atlanta Falcons' Half Time Marching Band), the World / Inferno Friendship Society plays every instrument known to man, and has dabbled in every musical genre you could name on a bet. Now this Music Theory class on wheels graces us with a sound that is too out there to be everyday pop, rock, ska, dance, or salsa (even though it sounds like all these), but is too goofy to qualify as serious prog-rock.